The wiper system of a vehicle is an integral system, as it greatly influences the visibility and affects safety of both the passengers and the vehicle. The wiper system is mandatory in passenger and commercial vehicles. Rise in the production of vehicles due to increase in the disposable income is fostering the growth of wiper systems. Rising consumer preference for SUVs, hatchbacks, and crossovers has expanded the application of wipers on the rear windshield. In 2017, SUVs and crossovers accounted for 42% of all vehicle sales in the U.S. In Europe, SUV’s accounted for 26% of all vehicle sales. Thus, rise in the demand for SUVs is anticipated to propel the demand for wiper systems. As the windshields of SUVs and crossovers have steep inclination, the air vortex is not capable to cleanse the rear windshield, as is the case of sedans and hence, they require rear wipers. Increasing utilization of rear wipers and rear motors is driving the wiper system market. Demand for luxury and better ride quality has propelled the usage of rain sensing wiper systems. Rain sensing wipers eliminate human interference by detecting rain/ snow and switching on automatically. The rain sensing wiper system also improves vehicle safety, as it minimizes distraction for the driver. The beam blade wiper system has no metal frame and fewer linkages, thus offering effective cleaning. The beam blade has maximum contact with the windshield, and its design makes it possible to offer optimum surface contact even on a curved windshield. The passenger vehicles are the biggest market for the beam blade wiper system. Development of technology is estimated to boost the penetration of the beam blade wiper system penetrate in the commercial vehicle segment. Rising demand and technological developments have led to advanced technologies such as dual motor wipers or direct drive system. The usage of two individual motor for each wiper arm permits non-requirement of the wiper linkage, thus saving more space and reducing the weight of the system. Reduction in weight of the wiper system is an emerging trend in order to comply with the rising government mandates on pollution. The analysis of the global wiper system market is conducted by segmenting on the basis of technology, wiper blade, component, vehicle, and region. Based on technology, the wiper system market can be classified into two segments. The rain sensing technology segment is estimated to witness significant expansion. The rain sensing technology segment accounts for a major share of the market in Europe and North America. High disposable income and demand for luxury and premium vehicles are major factors driving the rain sensing technology segment of the market in Europe & North America. In terms of wiper blade type, the wiper system market can be segregated into three segments. The beam blade segment holds a leading share of the wiper blade system market owing to its maximum contact points, aerodynamic design, and superior aesthetic appearance. The beam blade wiper system is still at its nascent stage in the commercial vehicle segment and thus, offers a wide array of opportunity. Based on component, the market can be classified into three segments. The wiper motor and rain sensors display prominent market expansion scope. The dual motor technology is at the introductory phase, the development of the system is estimated to rise the market demand and significantly raise the demand for wiper motors, as the front wipers are expected to utilize two motors against one. Rise in demand of rear wipers is also likely to boost the wiper motor segment as the rear wiper requires a separate motor. By aftermarket components, the market can be segregated into three segments. In terms of volume, windshield wiper and wiper motor segments held a prominent share of the wiper system market. Replacement of windshield wiper is required every six to 12 months, thus creating strong aftermarket revenue. Windshield wipers, being a serviceable part, require constant replacement has higher aftermarket demand than the OEM. Expansion of dealership network in developing countries and the rise in awareness about vehicle servicing is estimated to drive the aftermarket demand of windshield wiper. Based on region, the global wiper system industry can be segmented into North America, Europe, Asia Pacific, Latin America, and Middle East & Africa. The rain-sensing technology segment accounts for a prominent share of the market in Europe, followed by North America. Asia Pacific is a prominent manufacturer of wiper systems owing to the rise in production of vehicles in the region. Tax discounts on manufacturing of small engine vehicles in China has led to the increase in production of compact vehicles segment, thus expanding the wiper system market. The free-trade agreement signed in 2017 between Japan and the European Union is expected to benefit the vehicle exports of Japan due to tariff reliefs. Key players operating in the global wiper system market include Robert Bosch GmbH, DENSO Corporation, Valeo, Federal Mogul Motorparts LLC., HELLA GmbH & Co. KGaA, DOGA SA, Nippon Wiper Blade Co., Ltd., Pilot Automotive, Am Equipment, Mitsuba Corp., B. Hepworth and Company Limited, and Magneti Marelli S.p.A. In 2012, Valeo developed aqua blade for Mercedes Benz SL class, the wiper blade has integrated fluid channel to disperse the water directly on the windshield without using the conventional jets. The ‘Magic Vision System’, as named by Mercedes, minimizes the blind time between the spraying of water and cleaning of wiper, thus maximizing safety and also reducing the amount of fluid used. This allows for a smaller washer tank and eliminates the wiper jets and connections to jets. This report analyzes and presents an in-depth view of the global wiper system market. The market has been forecast for a period between 2017and 2026, based on revenue (US$ Mn) and volume (million units). The study encompasses the drivers and restraints of the global wiper system market. The report also covers key industry developments and technological road map that helps to overview the market. The study provides an in-depth analysis of the global wiper system market for vehicles by segmenting it in terms of technology type, vehicle, component, aftermarket, and region. These segments have been analyzed based on present and future trends. Regional segmentation includes the current and projected demand for automotive wiper system in North America, Europe, Asia Pacific, Latin America, and Middle East & Africa. The report also covers demand for individual application segments in all regions. The company profiles of major key players operating across globe are considered for the study. Key players operating in the wiper system market include Robert Bosch Gmbh, DENSO Corporation, Valeo, Federal Mogul Motorparts LLC., HELLA GmbH & Co. KGaA, DOGA SA, Nippon Wiper Blade Co., Ltd., Pilot Automotive, Am Equipment, Mitsuba Corp., B. Hepworth and Company Limited, and Magneti Marelli S.p.A. The company profile has been mapped over financials of company, business strategy, company overview, recent developments and their investments. The report provides the estimated market size of automotive wiper system market for 2017 and forecast for the next nine years. The global market size of automotive wiper system has been provided in terms of revenue and volume. 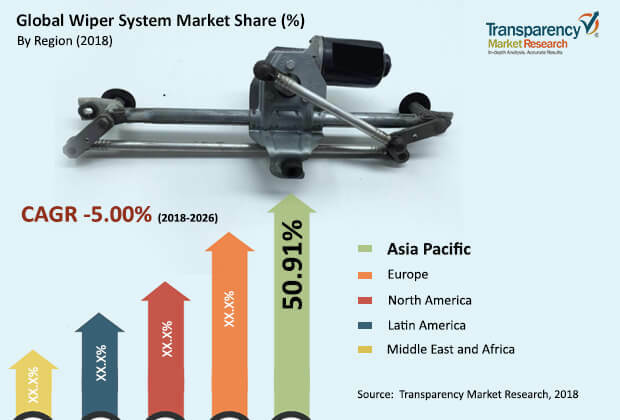 Market numbers have been estimated based on key component type, technology type, vehicle, and regional segments of the wiper system market for automotive. Market size and forecast for each major type and vehicle have been provided in terms of global and regional/country markets.